The U.S. March 2012 trade deficit jumped $6.41 billion to $51.83 billion in a month. This is a 14.1% monthly increase in the trade deficit. Exports increased $5.28 billion, a 2.9% increase from last month. Imports increased $11.69 billion, which is a 5.15% increase from February. Q1 2012 real GDP showed 2.2% annualized growth.. This article overviews and graphs the BEA statistical release for first quarter gross domestic product. Q1 GDP saw much less of an increase in private inventories build up, part of investment, an increase in personal consumption and a not to be believed increase in exports. As a reminder, GDP is made up of: where Y=GDP, C=Consumption, I=Investment, G=Government Spending, (X-M)=Net Exports, X=Exports, M=Imports*. The below table shows the percentage point breakdown of individual GDP components contribution to overall GDP. The difference, or spread, between Q4 and Q1 components is by percentage points. Q4 GDP 2011 was revised from 2.8% to 3.0%.. Here is the original BEA GDP report. Less imports than originally estimated gave the biggest boost to the Q4 GDP revision. Quarterly GDP is reported annualized. New Orders in Durable Goods, advance report, dropped -4.0% for January 2012. December durable goods new orders jumped by 3.2%, revised. While some will blame a business tax credit expiration, this report is across the board bad news. The annual trade data out of the December trade report has some shocking results. The 2011 trade deficit increased 11.6% from 2010. As a percentage of GDP the trade deficit is returning to pre-recession levels. The trade deficit is now 3.7% of U.S. GDP, up from 3.4% in 2010. 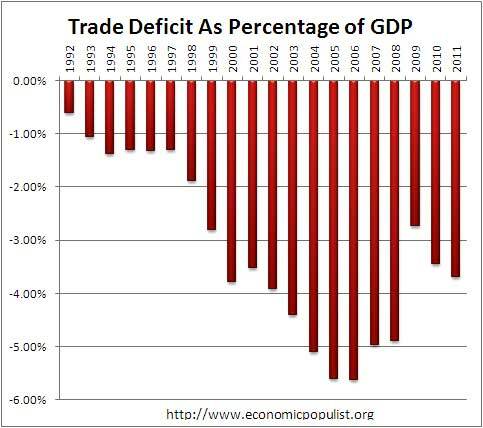 The worst was 2006, when the soaring out of balance, trade deficit was 5.6% of GDP. Below is a graph of the U.S. trade deficit as a percentage of U.S. annual nominal GDP. Q4 GDP 2011 came in at 2.8%.. Here is the original BEA GDP report. Q3 2011 GDP remained the same at 1.8%. Real GDP for 2011 is 1.7% for the year. 2010 saw a 3.0% real increase in GDP. Quarterly GDP is reported annualized. New Orders in Durable Goods, advance report, increased +3.0% for December 2011. November durable goods new orders jumped by 4.3% and October was a 0.1% increase. This means for all of Q4, we have an increase in durable goods new orders. Q3 GDP 2011 was revised down another 0.2 percentage points to 1.8%.. Consumer spending was revised significantly downward due to a large downward revision to medical expenditures. GDP was initially reported to be 2.5% for the third quarter, then revised to 2.0% on the second estimate report and now a measly 1.8% for the final, 3rd revision. Q3 GDP 2011 was revised down a full half percent to 2.0%. from 2.5%. Here is the original BEA GDP report. The downward revision was due to inventories, offset by a surprise reduction in imports. Q2 GDP 2011 3rd revision is in at 1.3%. This is a +0.3% revision from the Q2 2nd revision report, which reported a 1.0% Q2 GDP. Here is the original BEA GDP report. Q1 2011 GDP was 0.4%. The BEA reports real GDP by one decimal place of accuracy. Not rounded, real Q2 GDP was 1.34%.